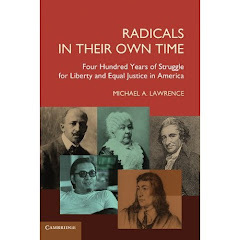 I've added a video introduction to my forthcoming book from Cambridge University Press, Radicals in Their Own Time: Four Hundred Years of Struggle for Liberty and Equal Justice in America (January 2011) (see you.tube link at right). I discuss the book in greater detail at "Great Americans Blog." Here is the OpEd on the McDonald v. Chicago Supreme Court decision that ran in various papers and news outlets around the country in late June and early July. The McDonald v. Chicago Supreme Court decision that the Second Amendment is fully binding on state and local governments is cause for celebration - even among those deeply concerned about gun violence in the United States. To emphasize the point that reasonable regulations will still be allowed, the Court quoted from the brief signed by 38 States supporting the Court’s ultimate decision, which said: “State and local experimentation with reasonable firearms regulations will continue under the Second Amendment.” And in this case the Supreme Court did not actually expressly reject the Chicago-area restrictions, but rather returned the case to the federal Court of Appeals in Chicago to determine if the regulations still pass muster. There is nothing unusual in the approach taken by the Supreme Court in this case. Others of our most fundamental rights may be regulated, but never prohibited outright - such as the First Amendment’s protection for freedom of speech and the Fourth Amendment right to be free of unreasonable searches and seizures. These and all rights are subject to reasonable “time, place, and manner” governmental regulations. Second, we bolster our claim on all of the rest of our constitutionally-protected rights – both enumerated and unenumerated (the right to privacy, for example) – when we adopt the sort of expansive view of liberty recognized in the decision. A faithful reading of the Constitution simply does not allow us to pick and choose from among those constitutional rights with which we may agree or disagree – and those rights should be protected not only from infringement by the federal government, but also by state and local governments. The one thing state and local governments may not do is enact regulations that prohibit a person’s right to keep a firearm for self-defense. Otherwise, not much else should change. Quite a hiatus for the summer - biggest blog-related news while I've been playing hooky was the McDonald v. Chicago decision in late June, where the Supreme Court held 5-4 that the Second Amendment applies to the States. Four of the majority justices reasoned that the clause is incorporated through the 14th amendment due process clause (the conventional argument); one, Justice Clarence Thomas reasoned it is incorporated through the 14th amendment privileges or immunities clause. Thomas's reasoning was the reasoning for which I argued in the amicus briefs and law review articles related to this issue. So, we wish we would have gotten a majority on the privileges or immunities argument, but at least Thomas agreed. One of the most disappointing parts of the case was that the four dissenters - Breyer, Stevens, Sotomayor and Ginsburg, people with whom I usually have more in common than not - did not go along with the persuasive history that the fourteenth amendment privileges or immunities clause was intended to apply the ENTIRE Bill of Rights to the States. I published an OpEd at the time of the decision, which ran in a good number of papers nationwide. I'll post that here. Coming out of my cave into the daylight again after finishing my book ("Radicals in Their Own Time: Four Hundred Years of Struggle for Liberty and Equal Justice in America," Cambridge Univ. Press) and submitting it to the publisher week before last. Quite the relief. I'm pleased with how it came out - should be out in bound book form in December or January. The Tea Party movement is not completely cuckoo. In fact, its focus on the Constitution should be welcomed by all Americans. When tea partiers inquire closely into the Constitution’s original intent, they will find what they expect to find: it was created, first, to protect individual liberty from overzealous government. As Thomas Paine (Common Sense, The Rights of Man, etc.) insisted: “Public good is not a term opposed to the good of individuals. On the contrary, it is the good of every individual collected. It is the good of all, because it is the good of every one.” Hence Paine advocated progressive taxation, aid to the unemployed, and free public education. Judging from yesterday's oral argument in McDonald v. Chicago (the case discussed here previously involving whether either the Fourteenth Amendment Privileges or Immunities Clause or Due Process Clause applies the Second Amendment to the States), it seems a majority of the U.S. Supreme Court will use the standard Due Process route to apply the right to bear arms to the States. Justice Antonin Scalia - who claims to be beholden to the text and history of the Constitution - belittled the arguments claiming that the text and history of the Constitution require consideration of the Privileges or Immunities clause. When Alan Gura, the attorney arguing the case, began his discussion of Privileges or Immunities, Scalia pointedly asked him whether arguing Privileges or immunities was "easier" than the due process argument. "[I]f the answer is no," he continued, "why are you asking us to overrule 150, 140 years of prior law?" Scalia also said that "What you argue is the darling of the professoriate"; and speculated that Gura is "bucking for a place on some law school faculty." Scalia brays loudly about the importance of original intent; yet when serious original intent arguments come before him that would be contrary to his narrow, cramped view of individual liberty, he is unwilling to listen. What a hypocrite. What a pleasure watching the Vancouver 2010 Winter Olympics over the last couple weeks. It's easy to be cynical these days about many things - even about the commercialism and politics surrounding the Olympics - but to see young men and women and spectators from all over the world coming together to participate in sport with such unadorned pleasure and fellowship.... well, it gives one hope for a better world. "Michael Lawrence’s book is a genuine tour-de-force.... A novel, exciting, and inspiring book, it is a must read.... "
See bottom of page for additional testimonials about "Radicals in Their Own Time"
Michael Lawrence’s book is a genuine tour-de-force, linking five Americans across four centuries who fought to improve their world. A novel, exciting, and inspiring book, it is a must read for all Americans who need to know more about their radical history. Lawrence has produced vivid and unforgettable snapshot portraits of five crucially important figures, who are not as recognizable as Franklin, Washington, or Jefferson, but whose impact on American history nevertheless cannot now be underestimated. His slice through history, highlighting the life and work of Roger Williams, Thomas Paine, Elizabeth Cady Stanton, W. E. B. Dubois, and Vine Deloria, demonstrates the commanding influence of those who have taken risks for all of us to ensure that our ongoing struggle to achieve the Constitution’s guarantees of liberty, justice, and equality will ultimately, someday, prevail. Liberty never expands without brave souls who stand up to the powerful forces that seek to constrict it. Students today know only a few of the names of those battlers and fewer still of their stories. Radicals in Their Own Times will open their eyes to characters they’ve never met, but whom they will find valuable tutors in the ways and costs of expanding human rights. This splendidly written book is a vivid and valuable contribution to our understanding of the struggles that yielded the rights and freedoms we too often take for granted. It has been more than half a century since John F. Kennedy's Profiles in Courage -- now Michael Anthony Lawrence repopulates American legal history with five forgotten (or at least sometimes forgotten) heroes. ... As Lawrence sweeps across four centuries of American history, he causes us to rethink American traditions of legal, religious, and political thought. And he reminds us all that American history is frequently more concerned with toppling hierarchy than supporting it.